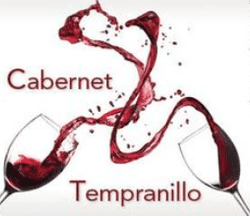 ​Cabernet – Tempranillo refers to the increasingly popular blend of Cabernets Sauvignon or Franc with the darling of Spanish viticulture, Tempranillo. In many ways the red wine blend is Spain's answer to the Bordeaux blend – this is beginning to be reflected in the pricing of the wines. When grown in warm climates, Cabernet and Tempranillo blends are bright with fruit flavors (dark cherries and prune), herbal accents (tobacco leaf), and rich, nutty notes (chocolate and cola). Given Spain's climate, achieving ripeness is generally not difficult, but cool-grown examples can show more vegetal characteristics of bell pepper and green beans. The middle palate is where Tempranillo expresses itself and adds sweet and savory flavors of stewed strawberries, making the jelly and doughnut analogy even more fitting. Sometimes Merlot is used as well, making a Cabernet – Merlot – Tempranillo blend.